Conan the Barbarian includes the stories originally written by Howard to be published in the magazine Weird Tales in the 1930s. These include the first published Conan story 'The Phoenix on the Sword' and short stories such as 'The Tower of the Elephant' through to longer tales like 'A Witch Shall Be Born' and the novel 'The Hour of the Dragon'. 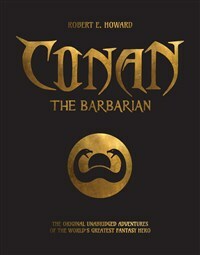 Although many have taken up the challenge to extend Conan's adventures over the years, Howard was a master of his craft, lovingly creating a mythical world in which his original masterpieces reign supreme. Conan the Barbarian is a name known throughout Cimmeria, Brythinia, Turan and all the territories bordering the Vilayec Sea - as well as most countries more familiar to us in the real world. The character has become a multi-faceted industry all on his own with toys, comics, card games, role playing games, TV series, movies (starring Anrold Schwarzenegger), video games and board games making him as famous in our world today as he was in his own world during The Hyborian Age. Robert Ervin Howard was born in Texas in 1906 and worked at various menial jobs before becoming a full-time writer across various genres including cowboy stories, horror and fantasy fiction.